Chelsea Mae's three handmade porcelain jellyfish “float” gracefully up your wall. Unlike some quick-darting sea creatures, jellyfish move slowly, suspended in an expanse of blue. 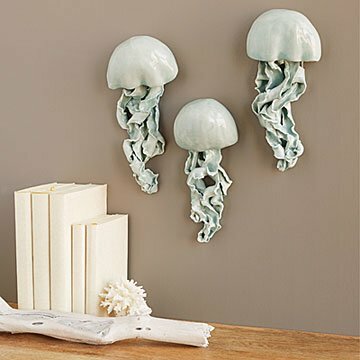 Now, three porcelain jellyfish "float" gracefully up your wall with Chelsea Mae's elegant sculptures. The set is handmade from a special pliable porcelain that allows her to create precise twists and folds throughout their tentacles. She finishes each with a one-of-a-kind glaze inspired by crystal pools of salt water. Whether hung in a beach house or a home far from the ocean, the designs make a beautiful gift for coast-loving friends. Handmade in San Clemente, California. Each Jellyfish is approximately 10"H x 5"W x 3"D.
To clean; wipe with a soft cloth, or run under water and towel off.